This package tour will make you aquainted with the State Hermitage museum, Saint-Isaak Cathedral and the Yusupov Palace. The Hermitage, also known as the Winter Palace, was the main residence of the Russian Tsar’s. The palace and it’s interiors were designed and built under the supervision of the famous italia architect Bartholomeo Rastrelli. Hermitage owns a great collection of the paintings of classical and modern artists. Among them are Da Vinci, Rembrandt, Roubens, Botticelli, Michelangelo, Goya, Durer and many others. 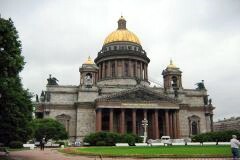 Saint-Isaak Cathedral is one the major landmarks of the city, and one of it’s symbols. It was built by the project of the french architect – August Montferrand, and boasts to be one of the biggest domed cathedrals in the world. Yusupov palace was owned by one of the richiest families in Russia – Yusupov’s. This family counts it’s history near the russian throne back to the XII century AD.